In September 2006, the Governor signed AB 32, the California Global Warming Solutions Act, making California the first state in the nation to cap greenhouse gas emissions. The law codified the Governor’s reduction goals: 1990 levels by 2020 and a 30 percent reduction in greenhouse gases. In January 2007, the Governor established the world’s first Low Carbon Fuel Standard (LCFS), to reduce carbon intensity of California’s passenger vehicle fuels 10 percent by 2020. In February 2007, the Governor led the governors of Arizona, New Mexico, Oregon, and Washington in creating the Western Climate Initiative to set a shared regional goal for carbon emissions reduction. In October 2007, the Governor announced that California and a coalition of European Union countries, U.S. states, and Canadian provinces would form the world’s first International Carbon Action Partnership (ICAP). In October 2008, the Governor signed SB 375, the nation’s first law to reduce greenhouse gas emissions by controlling sprawl. In November 2008, the Governor increased California’s Renewable Portfolio Standard Code to 33 percent – and streamlined the process of developing and permitting renewable energy sites. In January 2010, the Governor announced the first-in-the-nation mandatory Green Building Standards Code (CALGREEN). 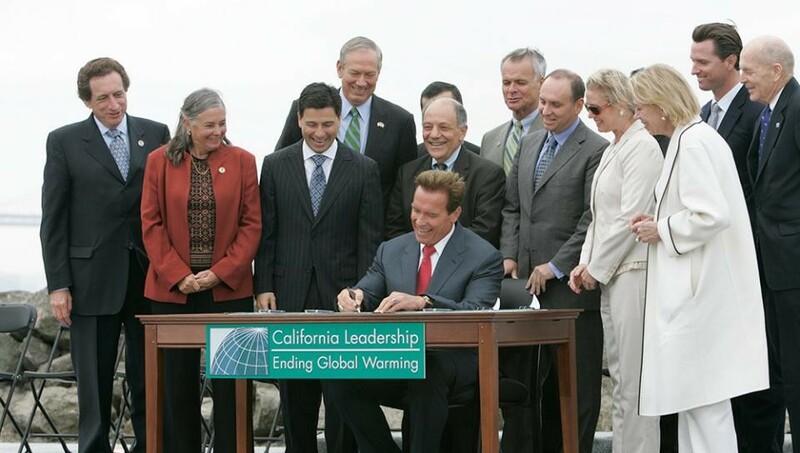 In 2010 Governor Schwarzenegger launched the Region of Climate Action, or R20, a non-profit coalition of partners led by regional governments that work to promote and implement projects that are designed to produce local economic and environmental benefits in the form of reduced energy consumption and greenhouse gas emissions; strong local economies; improved public health; and new green jobs. Infrastructure development for a growing and technologically advanced society is vital. With the development of alternative fuels and sources of energy in car travel, it was imperative that public/private partnerships provide the platform upon which modern technology can thrive. Governor Schwarzenegger recognized how the right policies can lead to a revolution in innovation in transportation, from hybrids to electric cars to biofuel and hydrogen technology and as a result created a Hydrogen Highway in California, providing more than 50 operational fueling systems across California that would support the growing market of hydrogen vehicles on the road. This infrastructure was vital to creating a market for Hydrogen cars. Governor Schwarzenegger established targets for the use and production of biofuels and biogas, and directed several state agencies toward the widespread use of these renewable energy sources. In August 2006, launching an all-out effort to make California the nation’s leader in solar energy, Governor Schwarzenegger signed SB I, his Million Solar Roofs Initiative. The plan provides California with 3,000 megawatts of clean, renewable energy and reduces the output of greenhouse gases by 3 million tons. In September 2004, the Governor created the Sierra Nevada Conservancy, pairing environmental protection and economic growth for the region, while protecting 25 million acres. In October 2004, the Governor unveiled the Ocean Action Plan – which set a national standard for the management of ocean and coastal resources. The 117-mile line connects San Diego with the Imperial Valley and went into service June 17, 2012. This, after five years of environmental review and permitting process and 18 months of construction. Governor Schwarzenegger negotitated in favor of the project for the entirety of his time in office, and finally saw ground broken during his last month in office. In 2006, Governor Schwarzenegger signed Assembly Bill 32, the Global Warming Solutions Act, to reduce auto emissions by 30% by the year 2020. In 2009, President Barack Obama announced a national standard for tailpipe emissions modeled on the Governor's legislation. Governor Schwarzenegger fought with President George W. Bush since 2005 over an EPA waiver allowing the stringent emissions standards to go into effect. President Obama's endorsement of Governor Schwarzenegger's endeavor is a landmark step towards environmental preservation.